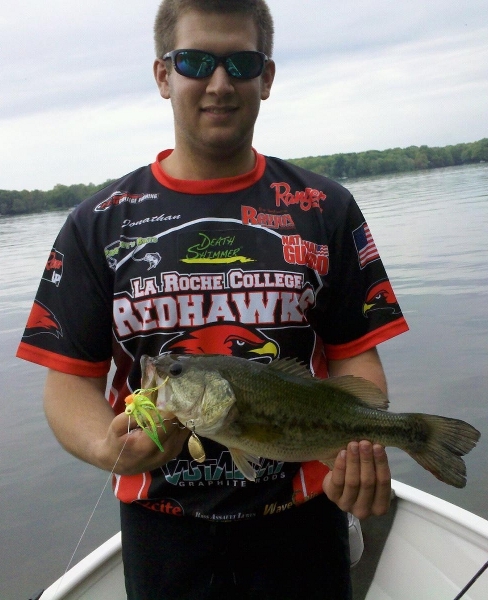 See what Tyler has to say about the Death Shimmer spinnerbait!! Take it from me Jim Wigal Pro Bass Angler, when you hear that there is a new lure on the market anglers must try them and not very often do they work or do what they say it will. When Rich with the Deathshimmer 2 called me to feild test the Deathshimmer 2 I was sceptical of its worth to me on the pro circuit, and then I threw it, this spinnerbait is like no other spinnerbait on the planet the vibration can not be explained you have to experiance it for your self. I threw the Deathshimmer 2 on a 7ft 1in GLOOMIS GLX with a 7:1 Shimano Carodo E-7 and reeled as fast as I could reel and it never broke the surface amazing. I also fished it in alot of different ways and the Deathshimmer 2 reactted heavenly. I will be loading the boat with the Deathshimmer 2 spinnerbait for this season and many seasons to come. Thanks for an awesome spinnerbait Deathshimmer. WOW…..Buddy…WOW! That’s about all I can say right now when it comes to the Death Shimmer! I mean how after all these years of fishing spinner baits do I find a spinner bait that literally shakes me out of my shoes! I have never felt that type of action out of a spinner bait and most importantly it catches fish. I was fishing the Death Shimmer in a tournament on the California Delta and a 7.2lbs largie knocked the fire out of the lure and of course I brought that “Criminal to justice!” It helped me take second place in that tournament on an extremely tough day. Fish on the Delta are finicky and smart due to the tons of fishing pressure so to be able to catch monsters in big tournaments on a tough days on the Delta makes this lure permanent part of my arsenal as I Police these waters!! Ripp’n Lipps Ent! Be a fisherman not a wisherman! Yeetadee!! The Death Shimmer 2 lure is the best spinner bait ever. I fish the California Delta recreationally and competitively and I always keep a spinner bait tied on at least one if not two of my poles. I have tried a many different brands and styles but no spinner bait currently out on the market compares to the vibration I get when I fish the Death Shimmer. I originally tried the Willow blade design and was very impressed with the quality, design and vibration but once I tried on the Colorado blade it was love at first cast. The Colorado blade shakes the water like nothing I have ever felt before. Most importantly it seems to drive bass on the Delta nuts because they have been annihilating this lure. I have been able to catch quality fish on the Delta with your lure on so really tough day…so to me that’s all that matters. You definitely got a great product here that I Ripp’n Lipps Entertainment definitely gives two thumbs up. Keep policing those waters! Yeetadee!!!! I just waxed a 7lbs toad on the Death Shimmer on the California Delta. I love this lure man!!! The vibration is sick. I can feel every thing!! This lure makes my rod tip dance like I got a deep diving crank bait on or something. These Delta bass seem to like a lot which means I love it! Great product man! This is the next best thing since canned beer!!! Keep Ripp’n Lipps Yeetadee!!! The “Death Shimmer” - which is a bait that’s also so incredible that if you like spinnerbaits, then these baits are a must! For the past 15 years I used only one spinnerbait in one color and in two different sizes. I have fished it all over the nation with great success and it seemed to catch much more bass than any other spinnerbait used by other anglers. I did make a little modification with my spinnerbait to cause much more of a vibration than it had right out of the package. But now! A fellow by the name of Rich Lau sent me a sample of his new baits a few months ago called the “Death Shimmer”, and let me tell you that I already forgot about the spinnerbait I had used over the past fifteen years. This bait of his had a very unique design in the wire used to make the Death Shimmer so gooood!, and when you first cast it and start your retrieve, you won’t believe the vibration this bait puts out. Simply go to www.deathshimmer.com and check it out for yourself. My name is Bret Dewitt. I am the manager of an outdoor shop and an avid bass fisherman! I fish multiple tournament trails including the Bassmaster Northern Opens. I am always looking for an edge when it comes to catching big wary bass. The guys at Law Lure Company have given me the edge i need to land fish that otherwise would have just let the bait go right by them! This revolutionary spinnerbait, that absolutely thumps and vibrates, is now my go to bait for tough bass! The design and quality put into this spinnerbait is absolutely amazing and unmatched. Just to put this spinnerbait to the test, I took a Strike King premier plus and threw it working my way down a half a mile shoreline! I caught what I would call a descent number of fish, or so I thought. I then ran back up to where I started and tied on a Death Shimmer of the same color, working my way down the same shoreline in the same direction. Lets just say that I put on a clinic of slaying some nice fish! I knew this spinnerbait was different, but to put on a show like that blew me away! To say that I'm hooked on this bait would be an understatement! The Death Shimmer is a huge success in my shop and on my boat! I almost wish I could keep this spinnerbait a secret because it is truly a lethal weapon on all bass! If you haven't tried it, I suggest you tie one on and watch your pole bend, trust me it wont take long! See you on the water and until then, keep your lines wet and a Death Shimmer on the other end! I am an avid tournament angler and have thrown every spinnerbait under the sun and as a tournament angler I feel that fish have seen spinnerbaits in all sizes and colors. They all do the same thing flash and cause vibration. But with the Death Shimmer it does something different. It has the flash of a willow blade but with all the vibration and thump of a colorado blade. Actually I would say that the vibration is more like a chatter type bait. Another attribute of the Death Shimmer compared to the run of the mill spinnerbait is being able to burn it. With normal spinnerbaits you want wind and cloud cover this is so the fish cannot get a good look at the bait. If you are going to throw one on a clear calm day you want to "burn" the bait and here is where you are limited if you "burn" a spinnerbait too fast it will break the top of the water and you loose the action of the blade. With the Death Shimmer you can "burn" it as fast as you can crank and it will not break the surface. I have tested this with 30lb mono and a 7.1:1 reel and tried to get it to break the surface with no luck. What does this mean ? I will be able to get more reaction bites and this is not going to be your normal spinnerbait that bass see day in and day out. In conclusion I will be replacing all of my spinnerbaits with the Death Shimmer and if you see me out there you best believe I will have one tied on. I would say that you have finally "built the better mouse trap". The Death Shimmer Spinnerbait is unlike any other spinerbait on the market. The new arm design makes the spinnerbait vibrate like a crank bait but give the flash of an original spinnerbait. This spinnerbait has caught many bass in ranging from 2-5 pounds. It has also put big bass in the boat when a bite was had to come by. This bait is a must have for any spinnerbait fisherman and I assure you that it will give you an advantage on the water!" Rich, I got about 15 minutes to tie on one of the spinners and test it in my pool. My first impression was it really thumps with just a willow leaf blade. Kind of felt like a big Colorado on it with more movement. Curious about how a Colorado blade is going to feel. So far they do thump! As an avid Bass tournament fisherman and professional angling educator for several decades, I have always been zealous about investigating new techniques and items. In spite of all my experience, one water condition continually frustrated me; high muddy water. I had always looked for a vibrating bait to use in this water condition, then a few years ago I purchased some Death Shimmer Baits. They were fantastic in the murky waters that had so frustrated me! They worked so well that I began to use them in all water conditions from clear to murky with great results. In my 20 plus years of competitive angling, I have never found a lure as diverse and effective as Death Shimmer Spinner bait. From: Jim Tobin, Pennsylvania Thanks for the Death Shimmer lures Rich!Check out what I did with em! I picked up your lure at the Sportsman show in Minneapolis last spring. I summer on a lake just east of the cities. I have fished this lake for years and have always done well. Never got that big fish until the Death Shimmer. I have caught bigger fish with this lure than any other. Thanks for a great lure! I am a professional tournament bass angler and when the conditions are tough and nothing else is working. Pick yourself up a Death Shimmer! The spinner bait gives off a vibration like no other! If you need a bait the makes the fish bite, this is the one that catches them every time. Reaction bites, something different, a lure that runs true in the water, this bait has everything! 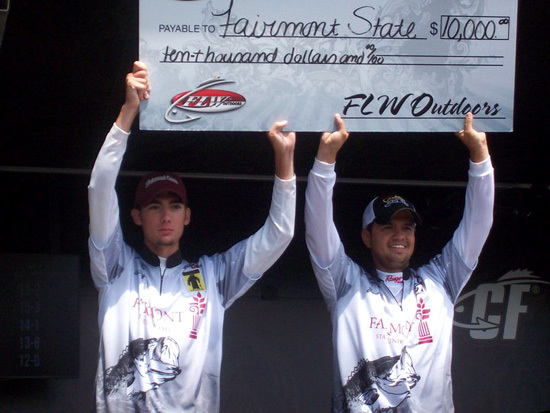 Take it from the rest of the anglers on this page! It works all across the country and it catches big fish! 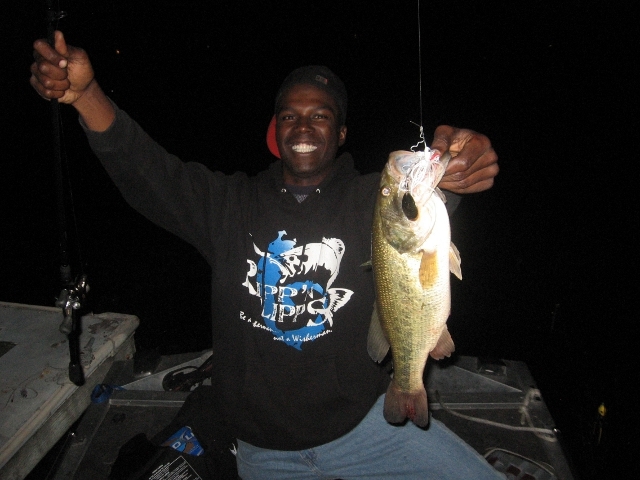 I have fished many different types of spinnerbaits over the years. About a month ago I was at Bill's Outdoor Center in Maryland and was introduced to the DeathShimmer spinnerbait. It is a spinnerbait like I've never seen before, the wire design is amazing! I had purchased the bait and first day out I was landing fish; the action, vibration, and movement from the DeathShimmer is unreal! You can real the DeathShimmer as fast as you want, and it will not role over or go in circles! The Death Shimmer is something the fish have never before and it shows! The design of this bait just blew my mind, and is definitely the best spinnerbait I've ever used! This is by far my new favorite spinnerbait. I'm not going to lie, I was skeptical at first but after using it a few times, it went to the front of the line when I am reaching for a spinnerbait. This bait has nothing but high quality components. The wire gauge is perfect, the swivel is incredible, and the wicked bends in the arm make a...ll the difference in the world. This bait is flawless right out of the package. The bends are truly genius and are what separate it from every other spinnerbait out there. The bends in the arm put off a lot more vibration than your normal spinnerbait. Also, it runs true right out of the package. 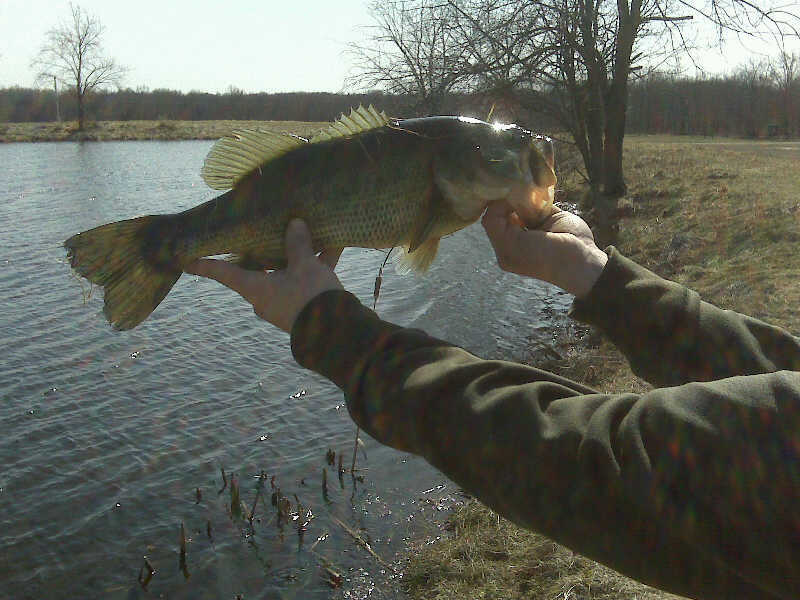 Plus, it flat out catches quality bass. I have already caught several solid 2-3lb smallmouth bass and largemouth bass in the three to four weeks I have been using the Death Shimmer 2. This is, in my opinion, the best spinnerbait on the market. I honestly see this being the next hot bait and/or the secret of many tournament anglers. Have a Testimonial you want to tell us about? We would love to hear or see your results!